Mathematicians often work with more than one function at a time, so it's helpful to have a way to give a function a "name." In function notation, the most popular letter to use is "f" for function, but just about any letter can be used to name a function. Let's look at how the function y = 2x will look if we write it in function notation. Instead of writing y, we'll call it function f and write f(x) = 2x. This is pronounced "f of x." The letter f is the name of the function. The x is written in parentheses to tell you that the variable for the input values is x (it does not​ mean f times x). ​Remember, f(x) = 2x is the exact same thing as y = 2x. Function notation just allows us to name a function (so we can know if we're talking about function f, function g, function h, etc.) and it gives us information about the input values (the x inside the parentheses tells us that we'll plug the input values in for x). In the examples above, we used the letters f, g, and h to name the three different functions. These are the most common letters used to name functions, but really about any letter can be used to name a function. Notice that all three examples use the variable x as the input variable. 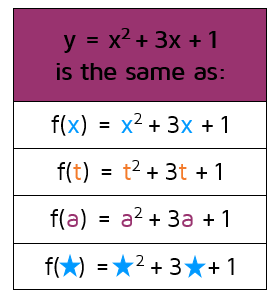 While x is probably the most common variable you'll use in algebra, it doesn't always have to be x. If you look at the table below, you can see several different ways to write the same function using different variables. The variable inside the parentheses is just the variable that's used for the input in the function. Remember, f(x) tells you that f is the name of the function and the x in the parentheses tells you that the function uses the variable x for the input values. The most common mistake students make is to think that f(x) means f is being multiplied by x. This is not the case. The first letter is just the name of the function. What's inside the parentheses represents the input value. If you see g(t), that means that g is the name of the function and the variable that's used for the input is t. If you see h(a), that means h is the name of the function and a is the variable used for the input values.